Picture a yard fence. What’s it made of? How do the fence posts appear? What color is it? These are all rhetorical questions to have you realize there is far more design options to fences than most people consider. Height of a fence is an important factor, along with the choice of material, color and post design. Plus, you’ll probably want a gate, depending on how much the fence encloses the yard, or other segment of your property. Each of these items comes at a cost, and we’ll walk you through that to help plan your project and determine reasonable cost expectations. The average cost has a very wide range, from $3.50 to over $20 per linear foot installed. While that isn’t exactly helpful, it does help to understand which materials are more expensive. The average yard fence fits into a range of $1,800 to $3,500, which is based on 200 linear feet, or enough to fence a quarter acre lot. The average lot size in the U.S. is 17,590 sq.ft. or about .4 acres. This is according the 2010 Census information. Outside of metropolitan areas, it goes to over a half acre (.64 to be exact). Fencing though is not measured by square footage, as presumably it would be around the inner edge of the perimeter. Instead, costs are determined by linear foot. Before we get into the many factors that contribute to fencing costs, there are preliminary considerations. A fence generally serves two primary functions: keeping unwanted creatures/elements out and containment. The latter establishes clear boundaries for what family and pets can do within bounds of own property, while also providing a sense of privacy. Obviously, some fences handle privacy better than others. A privacy fence makes a statement, where once life was open to the neighborhood, it is now, well less open. The first step of any fencing project is to consider what the neighbors may think of the fence itself being installed. This can be tricky, but depends on the neighborhood and the relationship, if any, you wish to foster with those who live closest to you. It is perhaps best to ask them their thoughts, while explaining your rationale for choosing to fence in any portion of your property. Because property lines can come into play and local building ordinances may be involved, be prepared for the local government to be involved in the planning stages. If a dispute arises with a neighbor regarding the planned fence, the city might be of help, though more likely scenario is you’ll want an attorney on your side to help communicate what needs to be communicated effectively and matter of factly. Surveying the land is also a key step in the planning stages. Understanding the composition of the ground and for sure what is below the surface (i.e. any utility lines) is mandatory consideration for any fencing project. Plus dealing with slopes or elevation changes are items to take into account during planning. Some of the surveying can be had via estimates from professionals, but this will not always be enough for what the local government will require in order to grant the building permit for the project. If you can obtain the original plot plan from either the local building board, or from the mortgage lender holding the copy of the original real estate purchase closing documents, it will make the whole process of getting the approval for your fencing project that much easier. Hiring a professional fence installer who has worked with local governments is your best bet. During planning is when you’ll pick fence type/material along with style. Those costs are covered in our next section. 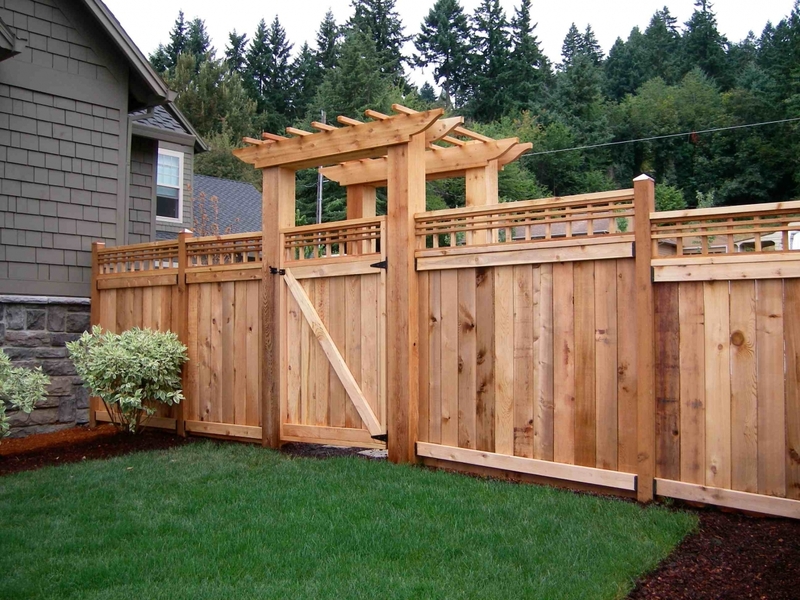 Fences are essentially made of 4 different primary materials: wood, metal, stone or hard plastic. Wood has sub-categories based on grains and then on quality. Metal sub-categories are as simple as iron/wrought iron, steel, and aluminum. Stone covers brick, limestone, and then other categories that make more for walls than fencing. Hard plastics include vinyl, PVC, and composite materials or wood and plastic combined. Styles of fences are numerous. The most popular are: picket fences, privacy fencing (often referred to as cedar fencing), chain link, post and rail fences, and wrought iron (think security). Lattices are also part of fence style that add ornamental features either on top of an existing fence, or on the bottom portion. Post caps are another common ornamental feature, with enormous amount of variation. Metal and hard plastics tend to mimic wood styles, though the wrought iron along with chain link fences are styles that are unique to metal fencing. Wire fences, electric fences and invisible fence start to show how extensive the topic can get. An invisible fence is literally without any structure, but keeps pets (namely dogs) within a certain perimeter. Our goal is to provide you with the basic fencing options relating to materials to help you with reasonable expectations for what you might see on a quoted offer from a professional installer. For the example below, we are going with a ballpark estimate for a three popular fence types, focusing on privacy. Not all fencing will have the same benefits. We list the positive reasons for a fence, and in the next section the disadvantages. Privacy and containment – this need not be around the entire yard and is usually ideal for back yard, or even a segment in the rear of a house where say a pool or patio might be. Keeping pets and children within boundaries that are visible to them. Design factor – Any fence, especially on the front of the house, ought to complement the color scheme and/or feel of the home. In the rear, this is less critical, but if noticeably different, it will stand out, especially to the next owner, or potential buyers. Security – Many fence types aren’t designed for security, but a few are. These may be less design friendly, yet their job is to protect inhabitants of the home and their possessions. Return On Investment – The ROI factor for a fence is generally low, but you can expect around 50 percent of total project cost to be reimbursed at time your home sells. Well constructed metal and stone fences may get as high as 70% ROI. Reduce Noise – Living on a busy street with much passing traffic can get loud at times. A solid fence (8 to 10 feet high) can reduce surrounding sounds by a few decibels. Neighborhood impact – Getting agreement from nearby neighbors is one of the first things to do for installation in metropolitan areas. Costs / Labor – The DIY approach is always an option in saving on costs, but the job can be hard work. Ensuring a fence is sturdy and level takes skill and muscle. It is definitely a 2-person job. The cost for hiring a pro is not too much, but enough to be a drawback. Maintenance – With wood this is especially a factor. That will show age within a decade. Other fences, not so much, but ensuring a fence remains sturdy is ongoing consideration. Unforeseen Items – Mowing the yard near a fence becomes more work. If not careful, the fence can get damaged. Additionally, if animals manage to get in, they may not be able to get out. The more ferocious the animal, the more danger the situation due to the fencing in the yard.